Sebastopol, California, August 18, 2017 - Emeritus Vineyards is pleased to announce they have been voted #1 out of 20 nominees in the USA TODAY 10Best Readers’ Choice travel award contest for best U.S. winery tour. Nominees were chosen by a panel of wine experts, writers, journalists and sommeliers and voting spanned for a period of four weeks. A tour of Emeritus will go from dirt to glass through the Hallberg Ranch Estate vineyard and winery. Guests start with a closeup look of the vineyard, learning about dry farming and other sustainable farming techniques and see firsthand the growth cycle of vines, how the famed Goldridge soil impacts the wine and see (maybe even taste) the difference in Pinot Noir clones. Inside, the winery guests experience the activity of the season, from bottling to harvest, with a front row seat to the action. After taking in the barrel cellar visitors settle into the rustic-contemporary tasting room for a flight of the estate grown and single vineyard Pinot Noirs, while taking in the sweeping vineyard views through floor to ceiling windows and peering into the cellar while sipping Pinot on the cozy couches. Hosts guide the tour and tasting to match guests’ experience levels, providing the perfect experience for both novice wine lovers and seasoned collectors. Tours are offered Thursday-Monday and are available by advance appointment only. Tours usually last around 90 minutes at $30/person. 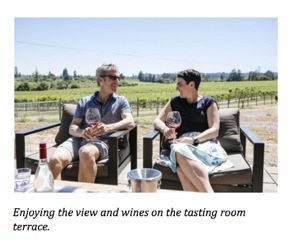 Additionally, Emeritus offers tastings of their dry-farmed and estate grown Pinot Noirs seven days a week from 10am-4pm. Appointments for tastings are suggested, though not required, for groups of 6 or less. For larger groups, advance appointments are required. Tastings are $20/person and usually take about 40 minutes. 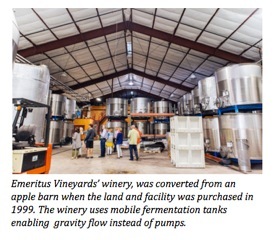 Emeritus Vineyards’ tasting room is located on the Hallberg Ranch Estate at 2500 Gravenstein Highway North in Sebastopol. Make an appointment online or call Emeritus at 707-823-9463 for reservations. 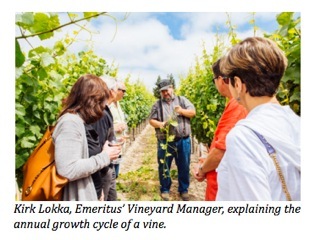 Emeritus Vineyards, is located in Sebastopol, California, the heart of the Russian River Valley. Established in 1999, the winery is defined by a commitment to producing noble Pinot Noir of the most distinctive quality. Wines are crafted around founder & proprietor Brice Cutrer Jones’s philosophy that soil gives wine its character, climate gives wine its personality, and man gives the wine its spirit (or style). The result is estate grown and bottled Pinot Noirs from two vineyards Hallberg Ranch, the home ranch in the heart of the Russian River Valley and Pinot Hill, from the Sebastopol Hills area of the Sonoma Coast. The 10Best Readers’ Choice Award contest allows the public to vote on a list of 20 nominees for specific categories such as best restaurants, hotels, resorts and vacation locations. Nominees for all categories are chosen by a combination of editors from USA TODAY, editors from 10Best.com, categorical expert contributors and other media sources. Readers are able to vote for one nominee once a day over a period of four weeks.